I have been looking at this painting quite a bit lately. It’s from back in 2010 and is titled Raise Your Eyes. Featured in my 2012 exhibit at the Fenimore Art Museum, it’s a piece that I find myself coming back to examine quite often. It’s different in many ways from the larger body of my work. For one thing, there are plenty of windows and doors, things I seldom use in my regular work where I prefer the blank anonymity of windowless and doorless houses. This painting is all detail, even though its not extremely fine detail. In some ways it reminds me of my Archaeology series, mainly because there is so many small touches to examine beyond the greater whole. I think that’s why I come back to this painting so often. Every new look reveals something I haven’t noticed since I first painted it. There are so many individual decisions here that dictate how the painting comes together, how it reads and expresses itself. Each window and door, each ledge and building top is a decision. Looking at them closer makes me appreciate the thought process behind it. 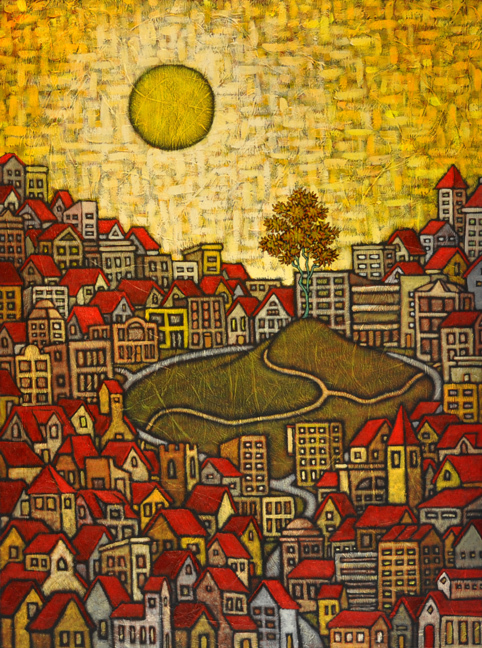 I mention this painting today because I am working on a new piece that is based loosely on it. At least, it goes back to the process behind it and fills the canvas with thousands of small but vital decisions. It’s been exciting to revisit and I like what I have so far. Keep an eye out for it in the near future. I also thought it might be a good painting to remind you to support your local small businesses on this Small Business Saturday. Every artist and every gallery owner is a small businessperson that rolls much of their income back into their respective local economies. Your patronage of artists and galleries. as well as so many other small local businesses, is vital to your local community. I know that I can’t do this, can’t maintain a career as an artist without your support. And I am deeply grateful for that support and hope you’ll continue to patronize the galleries that show my or anybody else’s work. Art is more than decoration, more than a product. It is an expression of humanity and a message that, in its best form, communicates through time. It is who we are. And that is worth supporting. Watched the news just now and they featured clips from around the nation that had shoppers pushing and shoving one another at department stores early this morning. Black Friday, of course. Scenes of a guy being taken away in a police cruiser after a fight with a lady over a $5 Barbie at some distant Walmart just don’t seem that unusual on this day. Good grief, as Charlie Brown might say. I only mention this because I am urging you to shop locally and shop small this holiday season. 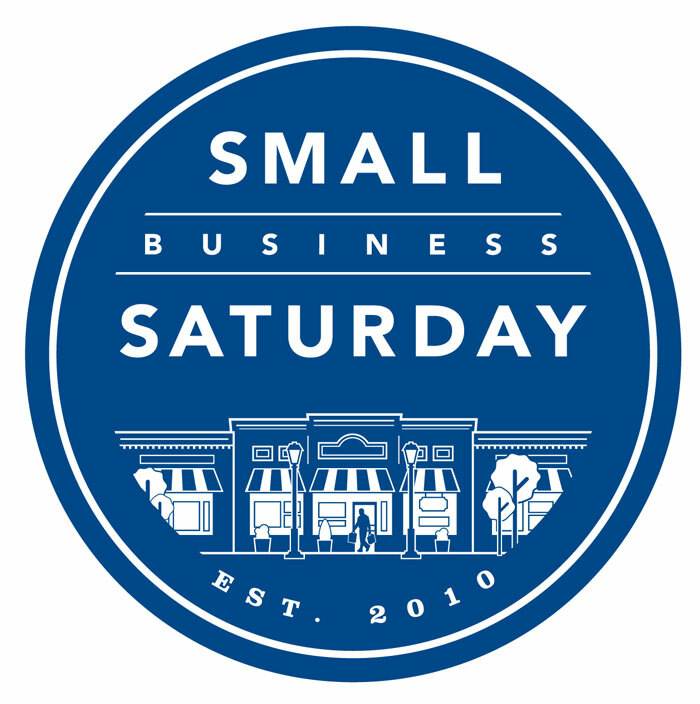 Tomorrow is Small Business Saturday where shoppers are urged to do just that– support their local, small businesses. It’s a concept that is very important to me as I am a small businessman, as is every artist. I create work that is art first. But after the creation, the distribution of this out into the world is not unlike that of all other products, requiring packaging, shipping and advertising, among other things. And every gallery that I sell my work through is a small business and all have been anchors in their local business communities for many years. For example, the West End Gallery has been a fixture on historic Market Street in Corning, NY for 38 years now. They show the work of over 50 local artists and craftspeople– glassworkers, jewelry makers and fine woodworkers. All are small businesses who buy most of their materials locally and who spend the bulk of their income locally, supporting other local small businesses in both ways. It is this cycle of small business that gives communities like Corning that vibrancy makes them beautiful places in which to live. This is a purely speculative statement but I would guess that most comfortable and livable communities, big and small, around the country feature a foundation of strong small businesses. After all, who can best serve the local needs? The answer is small businesses with a stake in the community. So, this year, please try to shop locally and shop small. You are feeding the lifeblood of your community when you do so. Besides, is a $5 Barbie really worth a beatdown or an arrest?